BTBD2d 13.44cts t.w. 12.7, 11.7 x 7.5mm (2 pieces) Brazil $225. Very well cut and polished in Germany, keeping the natural triangular cross section of the crystal. Precision drilled 1.3mm hole. Tricolor combo of light aqua, rich dark medium blue, and medium green, lightly included throughout. BTCE15 4.31cts 11.3 x 8.5mm oval Brazil SOLD Well cut high dome oval, medium pink red, very strong catseye visible in all light sources, rehealed fracture plane at one end slightly offsets the eye. BT63 3.61cts 9 x 8.7mm cushion Brazil $200. Very well cut and polished, rich medium dark green color, very slight inclusions, great ring gemstone! Reserved Rare larger Achroite gem! Absolutely colorless, very well cut and polished, excellent cut an polish with light inclusions. $430. Well cut and polished, pleasing medium greenish blue color, eye clean, nice pendent gem! $570. Excellent cut and polish, eye clean with great transparency, nice bright medium pink color, color shift to more peachy pink in incandescent light. Great gem tourmaline, would make a beautiful pendant gemstone. Nicely cut and polished slice of a tourmaline crystal, very good transparency, nice dark pink color. 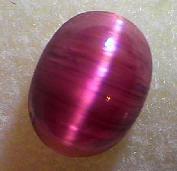 Pretty gem tourmaline, would make a beautiful pendant gemstone.